For those not familiar with it, Dongjiadu is a lower middle-class neighborhood south of the Bund, near the last remains of Shanghai’s old city. It’s old by Shanghai standards – some of the building might date back three centuries, I’m told – and poor. It’s also in the way of Shanghai’s ongoing redevelopment and bulldozers – in recent weeks, for better or worse (and often, much to the worst), it’s been disappearing. I think there’s rather too much wailing and gnashing of teeth by preservationists who couldn’t be paid to live in those leaky and miserable tenements; on the other hand, there are pieces of history in there worth preserving, and they won’t be preserved. I was down there earlier this week and the change is startling: a giant eraser seems to have been rubbed across whole city blocks. The other thing I found startling? The recycling. Above, workers load bundles of pencil-thin re-bar ripped from the concrete and masonry that used to hold up the buildings that stood where they now work. Before it could be bundled, it had to be cleaned, of course – which means that somebody – many somebodies – were paid to pick off the masonry and concrete that still adhered to that steel. I asked the foreman where the steel was going – nearby Bao Steel? – and his answer surprised me: it was on its way to be re-melted at a nail factory. Possibly, some of those nails will return to Dongjiadu, where they’ll be used to secure moldings in the expensive residential highrises to be built in place of the old tenements. What surprised me most about the recycling of Dongjiadu’s ruins is the intense localization of the processing. In my experience, Shanghai’s demolition scrap is typically packed and moved off-site as quickly as possible. 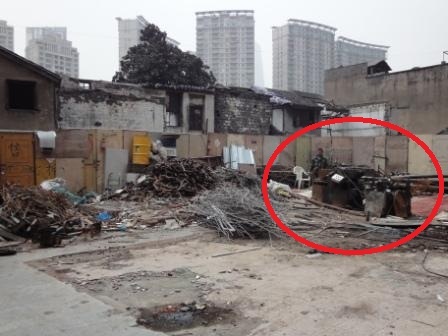 But something unusual is happening in Dongjiadu: there are two (and probably more) scrap yards that have appeared in the footprints of demolished buildings. Not only that, these scrap yards have processing equipment devoted to cutting the structural steel and other metal recyclables being generated nearby (they’ll get more for the metal when they sell it up the chain if it’s been pre-processed). In effect, Dongjiadu is consuming itself. Below, one of those yards in the footprint of an old tenement. I wasn’t able to get any closer, but it’s worth noting that the piece of equipment at the center of the yard is an alligator shear. Below, to make things abundantly clear, a very powerful alligator shear photographed at a scrap yard in Wuxi. Why is this important? I’m not sure that it is – but it is interesting if, like me, you’re interested in China’s waste stream and recycling economy. 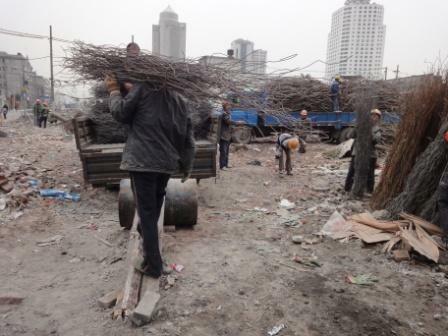 What we are witnessing here is nothing less than the mechanization of demolition recycling in Shanghai. 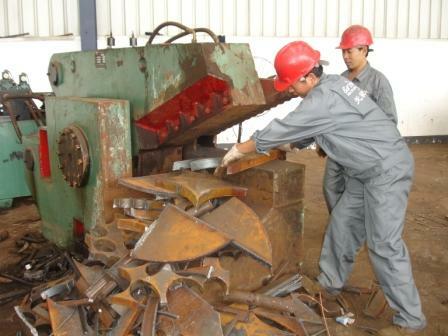 As noted above, this kind of equipment is usually found in larger scrap yards (at least, in China), and not in the small-scale neighborhood operations found in places like Dongjiadu (that can’t afford machinery). Perhaps a larger operation moved an alligator shear into Dongjiadu on the occasion of its demolition. Or maybe one of the smaller yards secured enough cash to invest in one, realizing that there’s a lot of money to be made on the neighborhood’s demolition. And that’s really the point here: somebody is making a fortune recycling Dongjiadu’s ruins. Enough to be shearing the scrap on-site, rather than sell it to a bigger scrap yard up the line. Good for them, I suppose. One last photo. 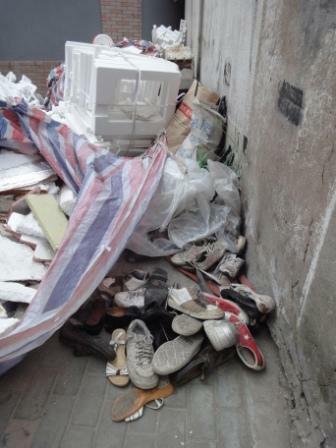 While wandering the area I came across a pile of shoes beside a family gathering up cardboard and styrofoam. Textile recycling is a big business, and even Nike recycles shoes. But I must admit, I hadn’t ever seen scrap peddlers collecting shoes on a mass scale, before. And the shoes, I’m told, we’re pulled from Dongjiadu’s ruins. The family that was collecting them told me that they sell for RMB .03 (roughly, US$.005) per kg to a plastics recycler in Hangzhou. This entry was posted in Architecture, Scrap, Shanghai History by Adam. Bookmark the permalink. A goldfield awaits you in Shangrila, yes, that very one in Yunnan, where outside the grounds of the Banyan Tree Ringha is a pastoral countryside littered with cast off shoes. No need to look hard, just walk in any direction for a few dozen yards and you’re bound to trip over someone’s old shoes, not always in pairs and mostly plastic. It seems the locals have a superstition about having worn-out shoes laying around the house so into the fields and along the roads they go. I hav been going there off/ on for about 3 years, and it was clear what was about to happen. I told myself so many times to take a camera because, like the hutongs, these were just going to go down wholesale. Your spotting the equipment there is quite interesting. perhaps the nail factory sent it over so that the scrap could be received evenly? There is another couple of areas in the Zhongshan park area that are painted to be demolished.. perhaps a walk through with a camera is warranted this weekend. There is a church in Dongjiadu. Is it still there? China, and in many ways Asia’s recycling puts the west’s to shame. Unfortunately it is driven by need and for many it is the only way to make a living. None the less it ensures a very imaginative process and one that has not been taken over by large corporations. Living in Shanghai you’ll see recycling in swing everyday, 24/7. The loss of the Hutong is a great loss and yet another step that is dehumanising the city. Personally the greatest loss are the family run restaurants which formed a key community base where people of all ages interacted. Yes, the church is still there. In fact, it’s receiving a giant new fresco. See here. Thank you for not blogging about google. you must be the only one. The question is whether China will continue to recycle so intensively as it grows rich. Once upon a time, peddlers would go around the backstreets of London knocking on doors and trading knickknacks for tin cans. But the Western public grew out of it as they grew richer. On the other hand, Japan is still doing really well at recycling. So that’s one data point for Asian recycling putting the West to shame, even at a high standard of living. Thanks for the link back. When I was there on Sun, tens of scavengers were running all over the large site picking up scrap metal and they were assembling in the back (west side of the lone temple). They would follow the excavators which dislodge mountains of rubble to siphen more scrap. A rather dangerous activity but kind of odd as they look like small ants spread out over a very huge space. Perhaps next time I should document the entire process.